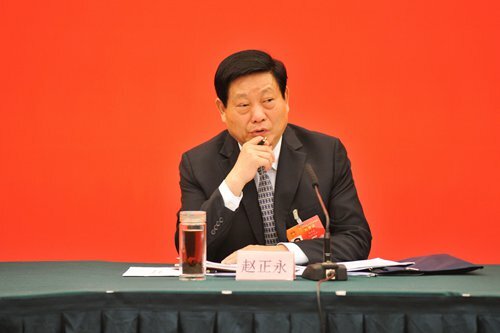 The Standing Committee of the Communist Party of China (CPC) Shaanxi Provincial Committee on Wednesday announced its decision to investigate former Party Secretary of Shaanxi Zhao Zhengyong, the Shaanxi Daily reported on Thursday. Zhao is under investigation for severely violating Party discipline and the law, the CPC Central Commission for Discipline Inspection announced on its website on Tuesday. Zhao is the first provincial-level official that fell from grace this year, news portal thepaper.cn reported. Born in 1951, Zhao started his civil servant career in East China's Anhui Province and began working in Shaanxi in 2001. Zhao served as the secretary of the CPC Shaanxi Provincial Committee from 2012 to 2016 and retired in March 2018. News of his investigation comes a week after China Central Television (CCTV) broadcast a documentary on January 9 detailing how a group of local Shaanxi officials were punished for failing to demolish a large number of illegal villas in the Qinling Mountains despite repeated orders from Chinese President Xi Jinping, also general secretary of the CPC Central Committee. The documentary showed that after Xi instructed Shaanxi provincial leaders to pay attention to the illegal villa problems in May 2014, "the main leader of CPC Shaanxi Provincial Committee failed to convey the instructions at standing committee meetings nor conduct special research on the illegal villa issue." Unlike most of the other Shaanxi leaders, Zhao did not appear in the documentary. Shaanxi has become an epicenter for the corruption crackdown and witnessed the fall of at least eight senior officials over the past few years, including a former deputy provincial Party chief, a former deputy governor and a former deputy of the provincial legislature, the Caixin Magazine reported. Wei Minzhou, former vice-chairman of the Standing Committee of the Shaanxi People's Congress, was sentenced to life imprisonment in November 2018 for taking bribes worth about 109.8 million yuan ($15.8 million). Wei served as a member of the Standing Committee of the CPC Shaanxi Provincial Committee and secretary of Xi'an Municipal Party Committee from 2012 to 2016. The investigation into Zhao indicates the Central Party's clear attitude in promoting strict intra-Party management and its consistent position in fighting corruption with zero tolerance, the Shaanxi Daily reported on Thursday. It said all Party organs and Party members in Shaanxi should learn lessons from Zhao and eliminate his harmful effects.